Brian Freeman knows what it's like to scale up his practice - that's what he's been doing for the past 4 years using MerusCase. MerusCase has helped Brian simplify his existing procedures, manage his employees, and greatly increase his caseload, year after year. 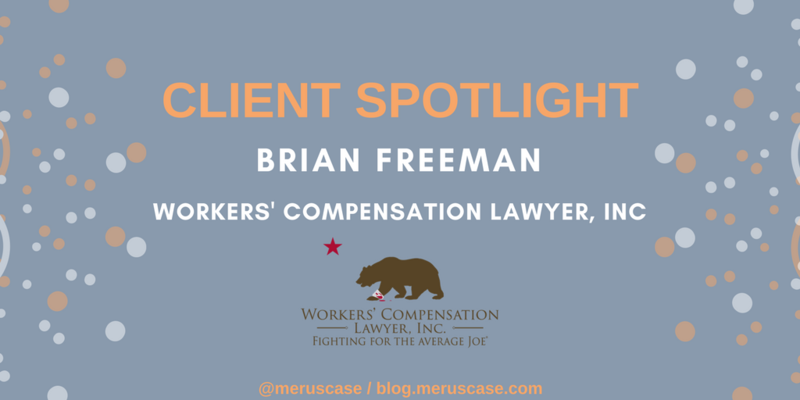 This MerusCase Client Spotlight will focus on Brian's firm, Workers' Compensation Lawyer, Inc, and how Brian has used MerusCase to elevate his practice. I sat down with Brian for a conversation about his success with MerusCase. Brian started his own Workers' Compensation practice in 2013, dedicated to fighting for the 'Average Joe'. He had used a few different practice management solutions before MerusCase, but found those options lacking. Brian was first interested in MerusCase for the JETfiling integration with the California courts, and soon noticed the other features that could greatly benefit his practice. Brian's firm has seen substantial growth in recent years, so we discussed the techniques he has used to foster that development. Q: You mentioned that you've had a lot of case growth. How much would you say your case load has grown since you started using MerusCase? A: Every year it has more than doubled since I've been using MerusCase. Another thing is that I've hired more employees, and they all work from home. I give them their own laptops and their own MerusCase accounts. I'm able to see their productivity - I love the dashboard because I can see who is getting things done. I also like the itemized list of firm activities so I can make sure that no one has taken a 2-hour nap! This all really helped me as an owner and manager to know what my staff is doing. Brian and I discussed the ways that his firm has evolved since he started using MerusCase. Q: Is there a part of your practice where the workflow itself has changed? A: Yes, due to MerusCase and how fast the firm has grown, I had to evolve my intake process with the demand. When I first started, I used to meet with new clients, explain the paperwork - the physical paper, have them sit there and sign the paperwork, and then scan it into the system. My average intake was about 1 or 2 hours. I knew that wasn't sustainable, so I switched to an electronic sign-up system. That reduced the intake time down to about 15 minutes, and I could drop the electronically-signed documents into MerusCase and do a quick filing. One workflow thing that is huge: we get tons of mail in workers' comp, and I hired an employee specifically for that reason. I was sick of scanning and processing the mail. Now, she uploads the mail for the day as a Batch Scan into MerusCase. That's super convenient - not only is all that mail not being stored in a giant storage room, but it's so easy to access now. Another employee reviews everything that comes in and sends me only what I need to see. It's really helped my paperless goals. MerusCase made it really easy to get there. Brian has always been very vocal about his support of MerusCase. Many of Brian's associates have taken his recommendation and are now happy MerusCase clients. I asked Brian about the big incentives to start using MerusCase. Q: What is your "pitch" to an attorney considering MerusCase? Is there anything in particular that highlights why they should make the switch? A: I would tell them to make the switch because it will make life so much easier, and your business so much more cost-effective. There is a lot of waste in these "paper-full" offices. You're hiring clerks to paper-file things, paying to store the files in a physical space. Lugging a big physical file through court is a nightmare, especially going up multiple flights of stairs. All I carry is a 12-inch MacBook - it weighs about one pound. That's it. It's so much better and cheaper than doing things the 'old-fashioned way'. Q: Thanks for your time, Brian. Anything else you'd like to say? A: Yes, one other main reason why someone should switch to a practice management software like MerusCase: having everything centralized is very important for organization. You don't want to have various systems tied together; it's too much of a technical headache. You want everything in one place. So I love that - all of our contacts in one place, tasks in one place. It does everything that you need to do, all under one hood. Thanks to Brian Freeman of Workers' Compensation Lawyer, Inc for his help with this post. If this post was interesting to you, be sure to subscribe to the MerusCase blog and follow us on Twitter, Facebook, and LinkedIn.